Running selenium tests can be very slow. But the typical response to speed is counter to modern software delivery. Teams normally increase speed by reducing test coverage, testing on fewer system and browser configurations, and doing their best not to update their test suite for fear of failed tests and re-runs. The best way to address performance is to change how you test. And parallel testing is the key. 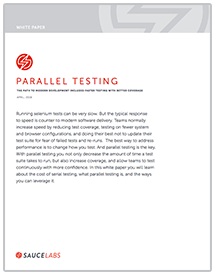 With parallel testing you not only decrease the amount of time a test suite takes to run, but also increase coverage, and allow teams to test continuously with more confidence. In this white paper you will learn about the cost of serial testing, what parallel testing is, and the ways you can leverage it.